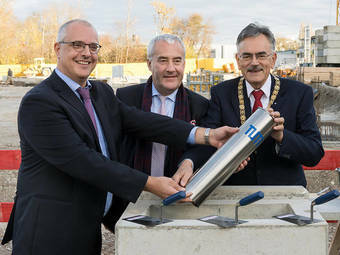 Cornerstone laying for "TUM Center for Functional Protein Assemblies"
With the “TUM Center for Functional Protein Assemblies” (CPA), protein research at the Technical University of Munich now has its own address. It will bundle research into the interactions of proteins interdepartmentally. On this basis, the interdisciplinary center will develop biomedical applications, especially against diseases resulting from dysfunctions in complex biomolecular protein systems. The construction costs of around 40 million Euro will be funded on federal and state levels. 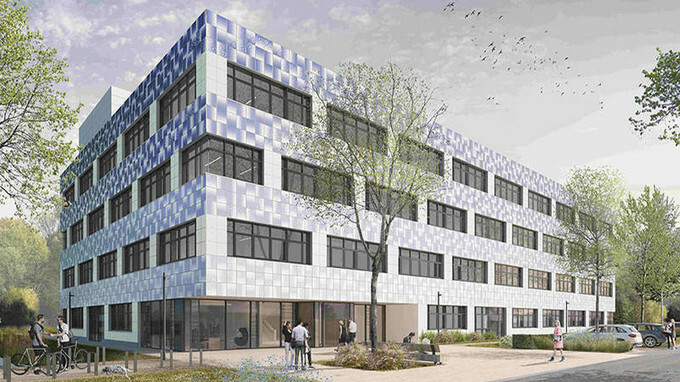 The laboratory building will be built at Ernst-Otto-Fischer-Str. 8. Human cells comprise a complex ensemble of biomolecules whose ordered interactions keep the organism alive and well. When dysfunctions occur, they can lead to serious diseases. Healing these kinds of illnesses requires a solid understanding of the fundamental principles of cellular functions. Decisive in this quest are proteins, which are made up of long amino acid chains. Their functionality and spatial structure have long been the subject of research at TUM. Albeit, the complexity of most processes has only become researchable incrementally following recent methodological advances. 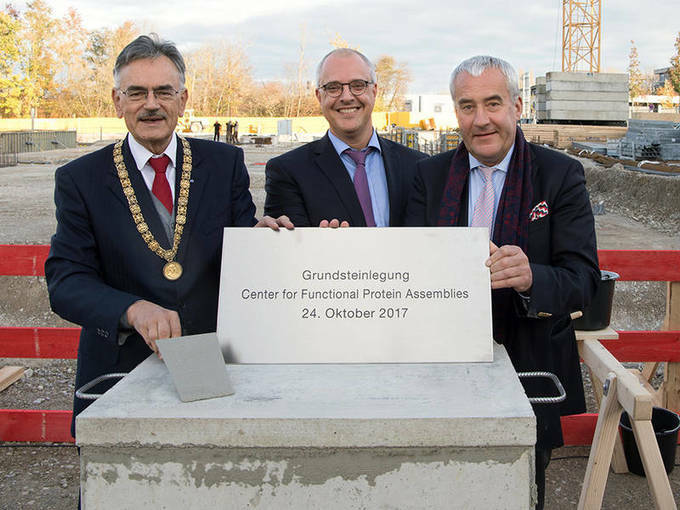 These dynamic protein interactions and the resulting functions will be investigated in the halls of the new research facility, which will offer some 4,400 square meters of research space spread across four stories. Physicists, biochemists and bioengineers will work in an interdisciplinary approach to research molecular and supramolecular mechanisms of action and to develop (bio)medical applications based on the results. 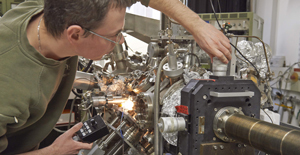 The CPA pools the expertise of its scientists and offers a range of large equipment as central technologies – like confocal optical microscopy, bio analytics and electron microscopy as well as X-ray crystallography. This infrastructure provided by CPA allows TUM wide collaborations – extending much beyond the members of CPA and their faculties. The architectural office Carpus+Partner in Aachen are responsible for the planning. The metal facade of the building will take its form based on a design by the Rosenheim artist Rena Ina Rosenthal. The building grounds were conceived by the Munich office of Nowak und Partner. Because of the center’s supra-regional relevance, the construction costs of 40 million Euro will be shared equally by the German Federal Government and the State of Bavaria. 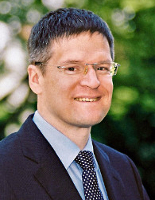 As a so-called integrative research center, the TUM Munich School of BioEngineering will provide the shared teaching and research platform for all relevant activities of the various faculties, including the medically relevant fields of engineering and informatics. 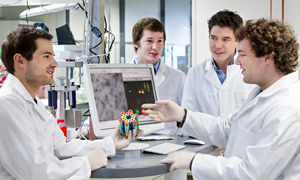 A wide array of cooperations with professors in Garching, Weihenstephan and Straubing extends the concept in the direction of biotechnology.